Mobile Pro Systems (MPS), a manufacturer of advanced mobile security solutions, recently announced an exclusive partnership with Lumizone Global, a global trader of steel and aluminum poles and related products, to integrate technology solutions by MPS with Lumizone Global’s outdoor lighting products. These integrated, turn-key structures, generally known as Smart Poles, are designed to increase public safety and support the Smart City Initiative by adding advanced video surveillance, deterrence, and communication features directly to a light pole. 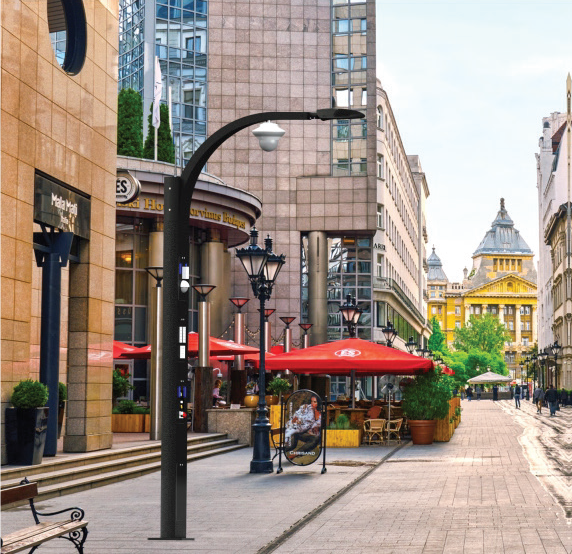 Each pole can be custom configured with options and features that meet a community’s needs at a particular location including cameras, interactive displays, vehicle charging stations, WiFi hot spots, micro cellular sites, motion detection, point of sale, and a powerful LED street luminaire. The Smart Pole is a module based technology platform allowing changes when technology changes to protect investments in infrastructure.